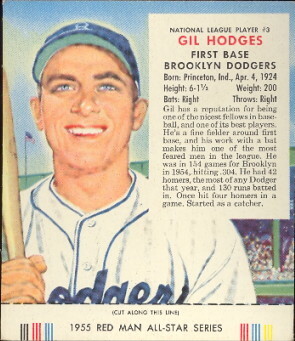 DAVE'S VINTAGE BASEBALL CARDS PRESENTS 1953-1955 Red Man Tobacco Cards. These set of 3-1/2" X 4" color cards were issued by a Red Man Tobacco from 1952 through 1955. The cards have redeemable tabs on the bottom so it is common to find them without the tabs. They are worth more with the tabs. 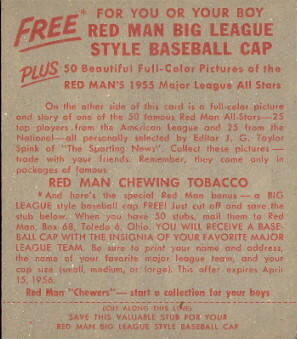 We now have 1952 Red Man Cards, and 1953 Red Man Cards, and 1954 Red Man Cards, and 1955 Red Man Cards.